The Men’s Health Survival of the Fittest London event is a mouthful to say, but what’s it like underfoot? On the freezing and windy morning, I thought I’d find out for myself. The venue was Wembley stadium, well around it, spilling over into industrial land and neighbouring sewage system! I’d booked less than a week before so only managed to get into wave 12, bang in the middle of all the day’s waves. I turned up with a friend with whom I’ll be doing plenty of races in 2016, as this was a fun opportunity to meet up and check our base levels of fitness before the 2016 season. 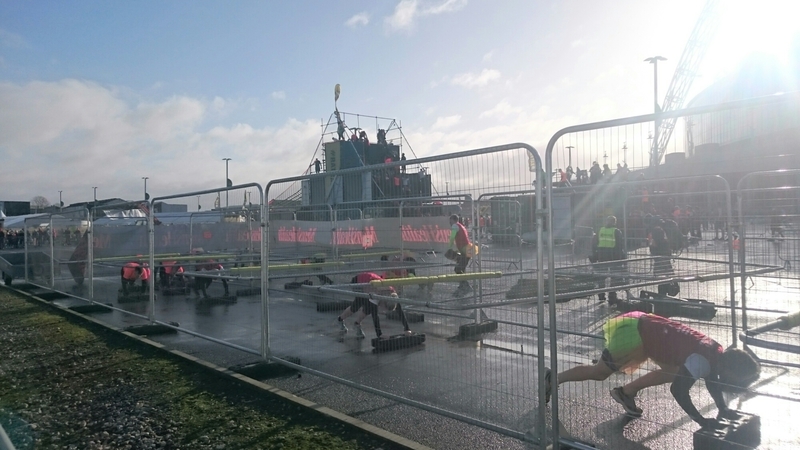 I was quite confident that I’d get round a half marathon distance obstacle course race in good time, which was quite unnecessary because I arrived and found out the course was 10k… At least it wasn’t the other way round! Wave 12 turned out to be mainly comprised of media luvvies and event sponsors’ employees, so we positioned ourselves at the front, and when the countdown reached “1”, we charged forward, and I was surprised how rapid some of these corporate folk were! Some hay bails, A-frame wooden walls, some innovative use of crowd control barriers to slide over. A bit of a run, up and down steps, and plenty of carrying of logs, cones and kegs (sadly empty) in between. The waits for some obstacles was over five minutes long, which forced the event to be a social one as you couldn’t help but mingle and chat with other people who chose to be out on that freezing morning. One of the many obstacles! There were a few bits of the run that I’d happily miss out – running through an industrial estate and through an unused office space. But there was innovative use of a sewage canal that went on… and ON! It was the real deal: a mostly submerged shopping trolley, plastic bags blocking feeder sewage pipes into the canal, water up to knee high in places. As I splashed my way past some of the more cautious runners I made sure not to swallow any of the spray! Coming back towards Wembley stadium, the obstacles got inventive, with ones criss-crossing over each other so spectators had a good view of the last few obstacles. One of the big obstacles was a huge inflatable stunt mat which you jump onto, on your back, from four metres up – fun! The high winds had forced closure of some of the obstacles, but not the highest ones, just ones prone to getting blown over (like six foot wooden walls). Still, accidents happen and I saw one guy fall backwards off a wall and smack his head on the tarmac. I went to help, and he seemed OK, other a likely concussion, so I eventually left him with his friend and the arriving medics. In conclusion, it was a fun morning out with a friend. It wasn’t as punishing as many of the other obstacle course races out there, but I guess that’s where its mass appeal comes from – I spoke and saw with all sorts of characters, from one guy who was doing the 10k course seven times in a day, to a father-son team, a lady who overcame her fear of heights to get over an obstacle, and let’s not forget the guy dressed in a full furry Chewbacca outfit! If you’re new to obstacle course races, if you want to have a team building morning with colleagues, or perhaps a fun day with friends, this is a great little morning with good facilities (except showers), great goodie bag, and all the other trimmings you’d expect from a veteran race organiser like Rat Race.